My number 1 in the Sussex Campers ‘Top 10 Most Beautiful Places in the UK’ is the amazing Isle of Harris, situated in the outer Hebrides chain of Islands, off the West coast of Scotland. There is an incredible diversity in the landscape, from the mountains in the North, to the numerous, unspoilt beaches in the South, the dramatic, rocky west coast and all of the glorious cliffs, moorlands, lochs and meadows. The spectacular scenery in this tranquil, idyllic getaway will really take your breath away. Although the furthest place away in my top 10 for most people, it certainly seems the most worthy of the long trip up there! Travel up through the lovely city of Glasgow, cross the Skye bridge onto the Isle of Skye and take a Calmac ferry from Uig to Tarbert. I would recommend visiting in June or July as they are the hottest months, with the longest days of sun and lowest average rainfall. There are two main campsites on the adjoining Island of Lewis that would be perfect for a trip in your campervan; Laxdale Holiday Park and Eilean Fraoich Camp Site with all that you would need from electric hook ups to clean, hot showers. 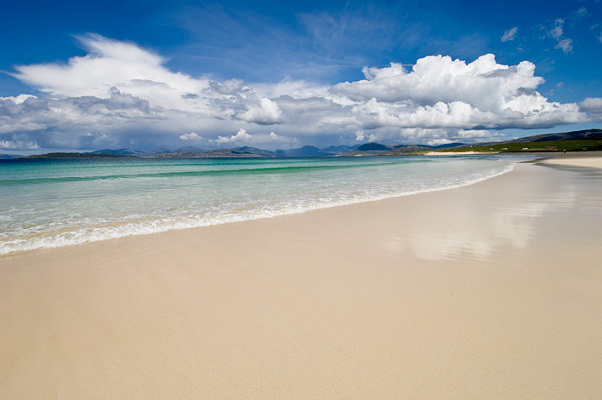 Embark on an adventure to the Isle of Harris in the Hebrides for an experience that you will never forget! Here is my number 4 in the sussex campers top 10 most beautiful places in the UK, to give you some ideas for fantastic trips away in your campervan… the Giant’s Causeway, Northern Ireland. It is thought that the cooling of some molten lava millions of years ago created the fascinating shapes of the Giant’s Causeway or, alternatively, that a giant ripped up the rocks as he ran along the coast… whichever you believe, this is a truly spectacular sight. For something really special, visit at sunset to catch the sea mists rolling in for a magical view. Once you have seen this coastline for yourself, it is easy to understand why the Causeway Coastal route, from Belfast to Londonderry, has been voted one of the top 5 tourist drives in Europe. 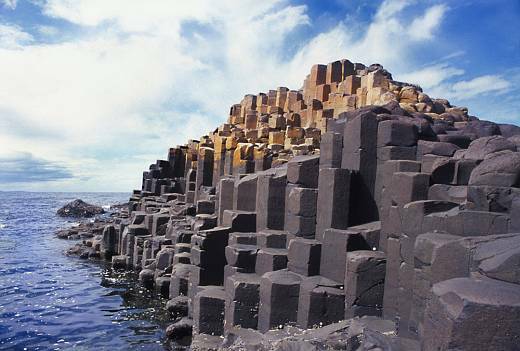 When you have seen seen the Giant’s Causeway, visit Portcoon, with its famous sea cave, made popular with tales of smuggling and ghostly pipers, or take a ride on the old Causeway Tramline. If you are feeling daring, take the coastal footpath to the exhilarating, and vertigo inducing, Carrick-a-Rede rope bridge. Go over to Carrick island with its diverse birdlife and amazing uninterrupted views across to Scotland, making it well worth the scary walk! There are so many activities to choose from in the area including horse trekking, sailing, sea and lake fishing, surfing, and coasteering. Dunluce Castle, situated on a cliff edge, is definitely worth a visit as it is surrounded by jaw dropping scenery, and gives you an insight into medieval Irish life. The coastline, dotted with fishermen’s cottages, small sheltered harbours, isolated ruins and shoreline fields, reminds you of the hard life farmers and fishermen endured throughout history, and a new state of the art visitors centre is due to be opened in September 2012, which will allow you to really delve into understanding the history and culture of the area, and give you tips for how to explore it for yourself. Ballyness Caravan park is ideally located for you to explore the Causeway Coast with all the usual facilities you could need, including electric, water and drainage hook ups, free hot showers and laundry room, as well as internet access and wifi.